Home Antique of the Week	A Manly Closet Chandelier! Greetings, Friends! Yesterday I was busy preparing for our electrician to come and install a few chandeliers. They have been in storage since the move and were a bit dusty. So, a quick cleaning and some touch up paint and they are good to go! Come check out a manly closet chandelier! I know. A chandelier in a closet is a bit over the top. In my defense, having a multiple arm chandelier does allow for great lighting. The current light fixtures in the closets in the master bedroom leave much to be desired. They did work, but they were not much to look at. And, since our main floor only has one powder room, often guests need to use our bathroom. So, why not improve the view? Circular fluorescent lighting? No thank you. I bought this beauty on the Facebook Marketplace right before we left Doylestown. You guessed it. It was $20! I love the shape of this fixture and how the base of it looks like a crown. So, who better to have this in his closet than HRH, the king of the castle? I was told when I purchased the fixture that it was in good working condition. You never know for sure until it’s hung. And the good news is-it works perfectly! The crystals cleaned up nicely. I had to operate a bit on a few to secure the hooks, etc. I remember having some amber-colored crystal chains from a previous fixture but alas, they have not surfaced since the move. If they do, they will join in the fun. After the electrician finished hanging the fixture I attached the crystals. 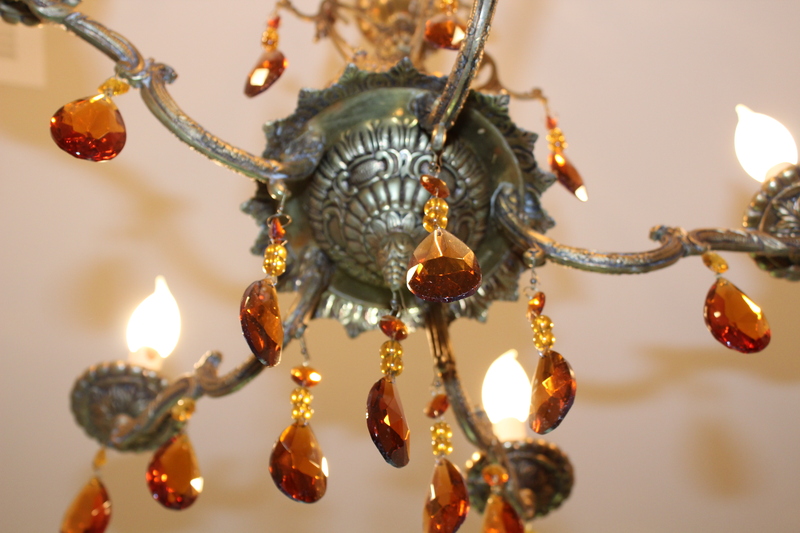 In my mind the brown/amber crystals give the fixture a manly look. And honestly, my husband doesn’t mind when I hang chandeliers in every corner of our house. After 34 odd years, he doesn’t bat an eye. Plus, now the lighting in his closet is much better than before. Wallah! Here it is in all of its royal glory…. I love it so much! And my husband keeps a much neater closet than I, so I will be glad to keep his closet door open just so I can enjoy this beauty whenever I walk by. Also, usually I don’t use white bulbs but I had them on hand as well and they work. The amber crystals seem like the perfect choice. Tomorrow I’ll work on the one in my closet. I’m thinking of oodles and gobs of sparkly crystals! Maybe even some crystal chain? Hmmm. Anyway, for now we can enjoy HRH’s chandelier! I’ll take the old fixtures to our local Christian Ministries. They are still in good working condition so I”m sure someone can use them for something. I hate to throw away anything that is reusable. But, I think you’ll agree this is a huge improvement! My husband is simply glad to have higher wattage lighting in his closet. And you know how much crystal chandeliers make my heart sing!